Compare++ is a visual diff tool for programmers and web developers. 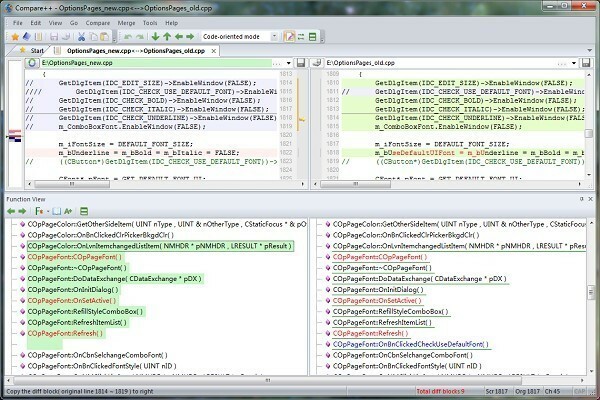 It can structured compare and merge source code, compare and synchronize text files and directories quickly. The function view is useful to review all code structure changes.The features include: detect and list all the structure changes such as removed/added/modified C++ functions; compare similar structure even in completely different files; compare two sections; compare some lines with clipboard; one step to merge one or more differences; html and text report; syntax highlighting; unlimited line length; in-place editing and comparing file content; detect file and folder changes in disk; integrate into Windows Explorer's context menu; integrate with version control systems and Visual Studio; drag and drop support.The program's graphical user interface is a multi-tab window which includes a startup view, one or more file and folder compare views. Start view provides an interface to load new files or folders, a history list to open auto-saved files or folders and includes two buttons to open folder or file compare view. Folder compare view hierarchically lists folder comparison results in a side-by-side panel and provides powerful "compare with..." which makes it easy to compare any two selected files. File compare view displays all file comparison results in a side-by-side or over-and-under panel and includes "overview bar" to help user locate difference, "function view" to list all structure changes. The program provides extensive options to customize compare rules, colors, fonts and operation setting.